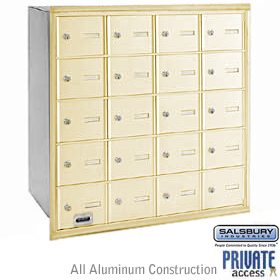 Made of extruded aluminum, Salsbury standard recessed mounted letter boxes are 15"e; W x 19"e; H x 6-3/4"e; D and are available for U.S.P.S. access or private access (includes factory installed commercial lock #2246). Units fit into a rough opening (13-3/4"e; W x 17-3/4"e; H x 6-3/4"e; D) and are secured with mounting hardware (not included) through the back or side panels. A fully integrated flanged collar fits over the rough opening. Standard recessed mounted letter boxes feature an 11-1/2"e; W x 3/4"e; H mail slot. Custom slots (related item #2249) and custom engraving (related item # 2266) are available as options upon request. Plexiglass windows (related item #2273) and a non-locking thumb latch (related item #2288) are also available as options upon request for units not serviced by the U.S.P.S. Standard recessed mounted letter boxes are ideal for apartments, condominiums, commercial buildings and many other applications.